Rob Kardashian has been under fire from his own family for dating Blac Chyna. Social media exploded with saying this was a publicity sham but after a huge engagement ring was spotted on Chyna’s finger things started to look more real. 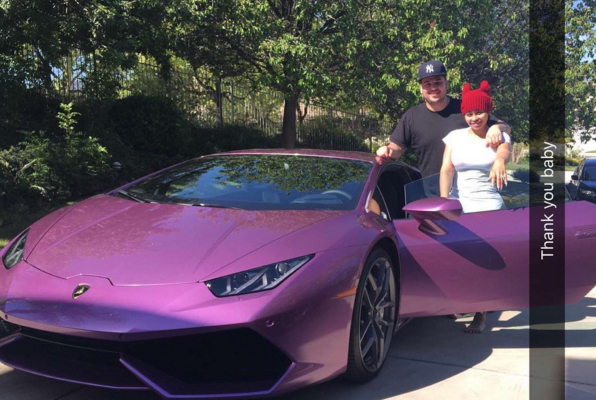 If that was not enough to convince you of how serious these two are, on Wednesday, April 20, Blac Chyna was on Instagram showing off a purple lamborghini that Rob Kardashian bought for her. Blac Chyna expressed thanks by writing “Thank you baby for my Huracan Lamborghini @robkardashian ?”. The picture shows Chyna, 27, wearing a white shirt standing with her future husband Kardashian, 29, next to the car which is said to be worth more than $150,000. Remember it was almost a year ago Tyga, who happens to be Blac Chyna‘s ex and father to her son, gave Kylie Jenner a white Ferrari for her 18th birthday. This was in August of 2015. Jenner is half-sister Rob so there seem to be a love for these kind of luxury cars in the family. After Chyna made her relationship with rob public in January, the critics came out like a hungry pack of hyenas saying she is a gold digger and it was not for love but for money. With the recent proposal and now her hot new set of wheels, Chyna is certainly having the last laugh.